Full Shop manual for Ghia/Chrysler Turbine Car. From the makers of many fine shop manuals and parts books on CD. In searching the web, I found that MuscleCARS LLC has the rights, from DaimlerChrysler, to produce Chrysler publications, which they printed before 1978, in CD-Rom format. They have a very good line of Chrysler parts manuals and Chrysler shop manuals on CD and you should check them out if you have need of one. 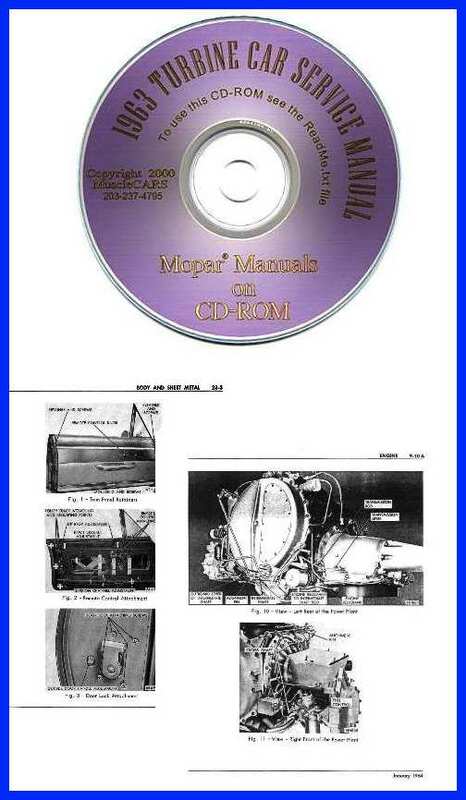 They are trying to get all older Chrysler manuals on CD so, if you have a rare, old manual, and you would like to share it, let them know - just click on their underlined name above to link to their pages. This CD is full of interesting images and facts about the car, it was used by the coordinators that Chrysler put in the field to keep the fifty cars running. The original, paper manual, was a very limited production item that the Service Training and Publications Department of the Chrysler Motors Corporation (part of Chrysler Corporation) put together in a large three ring binder. There were probably less than fifteen of the originals made. I purchased the original manual, which this CD was made from, last may. I purchased it from a brother of an alternate coordinator. His brother had loaned it to him and unfortunately he died before the brother returned it. It was found in a bunch of other old books this spring and he contacted me to see if I was interested in it or knew what it was worth. I purchased it and now want to share the information with others who are interested in the 1963 Turbine car. This is a very professional, self running package, that lets you arrange, zoom, pan, jump around the manual or read it in order. It requires Windows 95, 98, NT or 2000 and all the custom software needed to view the manual pages, is included on the CD. If you are interested in purchasing this CD, the catalog item number 81-570-1963. The List Price is $50.00 call and order one today direct from MuscleCARS LLC and if you tell Dave Waller (moparmanuals@hotmail.com) - (203)-237-4795 that you saw it here and mention SPECIAL SALES CODE - 4MEO2 - you will receive a discount of $5.00 off the list price AND Free shipping anywhere in the U.S.! Click Here to go back to History page or use the Back Button! Click Here to go back to main page or use the Back Button!